In February, scientists reported that TANK-binding kinase 1 was a potential amyotrophic lateral sclerosis gene. Now, another research group has arrived at the same conclusion, and even extended the association to frontotemporal dementia. As outlined in the March 24 Nature Neuroscience online, researchers led by senior author Jochen Weishaupt at Ulm University in Germany identified TBK1 mutations in people with familial ALS. Overall, dominant TBK1 mutations made up 4 percent of the familial ALS cases examined. In the study reported last month, TBK1 mutations explained fewer than 2 percent of ALS, though they were mainly sporadic, not inherited, cases (see Feb 2015 news). Joint first authors Axel Freischmidt and Wolfgang Ruf at Ulm, Thomas Wieland of Helmholtz Zentrum München in Neuherberg, and Benjamin Richter of Goethe University School of Medicine, Frankfurt, all in Germany, screened the exomes of 252 people with familial ALS, discovering one TBK1 deletion and six nonsense mutations predicted to truncate the protein product. They found another nonsense mutation in one person in a set of 1,010 people with sporadic ALS. Among 4,578 control exomes, they observed one nonsense mutation—in a person who had two relatives with ALS. Eight TBK1 mutations occurred in a further 60,706 exomes from the Exome Aggregation Consortium database, managed by the Broad Institute in Cambridge, Massachusetts. This database includes various exomes from population and disease-specific studies. The authors speculate that those mutation carriers might be from a schizophrenia data set included in that consortium, because ALS and schizophrenia have been linked by a family in which the conditions co-occurred (Gunnarsson et al., 1991). All told, the researchers—including co-senior authors Tim Strom of Helmholtz Zentrum München and Peter Andersen of Ulm University—identified the eight TBK1 mutations in 13 families (some families shared the same mutation). They examined disease penetrance in seven of those kindreds. Thirty-three carriers were diagnosed with ALS, at an average age of 60 years old. Seven others, aged between 60 and 74, have shown no symptoms. Overall, this suggests a high penetrance, the authors wrote. Though the majority of affected family members had ALS, half also showed signs of cognitive impairment, some with full-blown frontotemporal dementia. Autopsy brain samples were available from one family member who had died soon after diagnosis. This person had extensive TDP-43 positive inclusions as well as inclusions containing p62, which interacts with TBK1 and is encoded by the ALS gene sequestosome 1. How might TBK1 mutations cause motor neuron disease? The protein contains a kinase domain, a ubiquitin-like domain, and two coiled-coils (see image above). The authors predicted that the nonsense mutations would result in loss of the protein. Sure enough, when they examined cell lines derived from the patients with the truncations, they observed that TBK1 mRNA and protein were half of the normal levels. TBK1 mutations probably create disease due to haploinsufficiency of the protein, conclude the researchers. The deletion, which eliminated half of the second coiled-coil, did produce a smaller protein. This allowed Freischmidt and colleagues to investigate which part of TBK1 might be crucial for motor neuron health. The coiled-coil normally interacts with adaptor proteins, including optineurin, which has also been linked to ALS (see May 2010 news). The deletion mutant did not bind optineurin, however, the other domains still seemed to work, because the smaller TBK1 bound and phosphorylated one of its substrates, interferon regulatory factor 1. The authors suspect loss of the second coiled-coil would be sufficient to cause motor neuron disease, though they have not tested that yet in cell or animal models. Freischmidt A, Wieland T, Richter B, Ruf W, Schaeffer V, Müller K, Marroquin N, Nordin F, Hübers A, Weydt P, Pinto S, Press R, Millecamps S, Molko N, Bernard E, Desnuelle C, Soriani MH, Dorst J, Graf E, Nordström U, Feiler MS, Putz S, Boeckers TM, Meyer T, Winkler AS, Winkelman J, de Carvalho M, Thal DR, Otto M, Brännström T, Volk AE, Kursula P, Danzer KM, Lichtner P, Dikic I, Meitinger T, Ludolph AC, Strom TM, Andersen PM, Weishaupt JH. 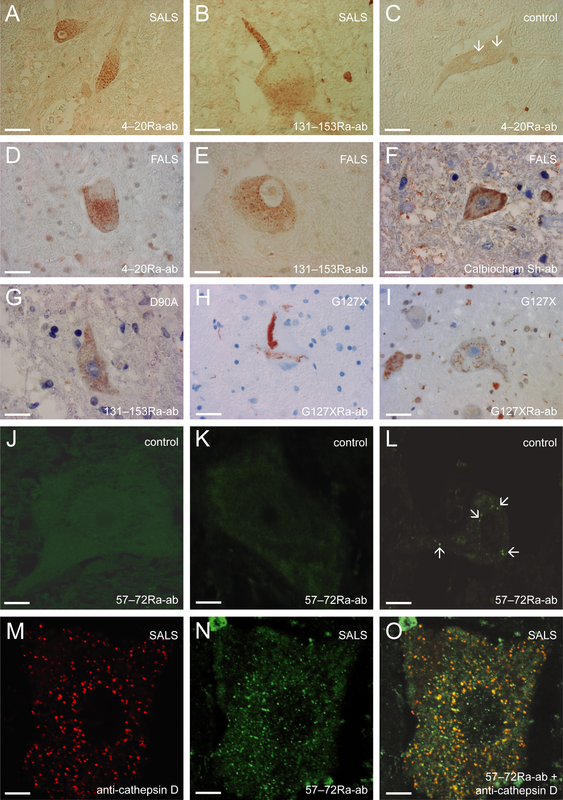 Haploinsufficiency of TBK1 causes familial ALS and fronto-temporal dementia. Nat Neurosci. 2015 Mar 24 ; PubMed.